Hand feeding and removing the paper from a motorized floor-model platen is a dance between your hands focused on timing. THIS C & P TECHNICAL WORKSHOP introduces you to letterpress printing on a typical floor-model platen press. 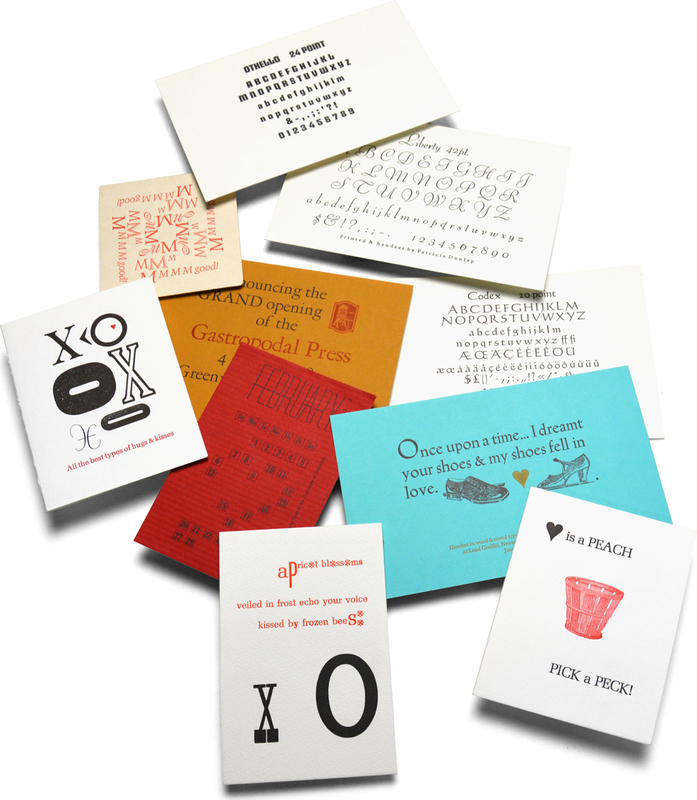 If you are a serious hobbyist or are interested in starting a letterpress business where speed and versatility are required, this workshop is an important learning experience. It's especially good for those who have access to a similar press or who are considering acquiring one. Appreciated for their speed, relative simplicity, and reduced floor space, these machines often formed the backbone of the 19th-century print shop, as well as being a fixture in contemporary letterpress shops of all sizes. It is commonly known as a "jobbing press" because it operates quickly and can be set up for multiple operations (printing, scoring, perfing and die cutting), all on the same press. Wear comfortable shoes and work clothing. Dress for the weather: we are not air-conditioned, and in winter much of the heat rises to the top of our 20-foot ceiling. Bring questions, your camera and a notebook to record your process. YOU WILL BE PRINTING on a motorized C&P platen press set to print at about 860 impressions per hour. Whether motorized or treadle operated, this style of platen press is powerful : your complete concentration without distraction is required while your machine is in motion. While we print the bulk of our work at Lead Graffiti on our Vandercooks, we rely on our floor-model platen for quickly printing detail areas, like credit lines on the backs of greeting cards, return addresses on envelopes, and handling small, thick coaster stock. As versatile as it is quick, we also need the C & P for scoring note cards & invitations and die-cutting ganged-up business cards. This is a stillife of various cards, small broadsides and coasters printed on our tabletop or floor model platens. ⬆ This is a 32-page book of poetry related to Robin Hood we printed for the International Association of Robin Hood Studies' annual conference. 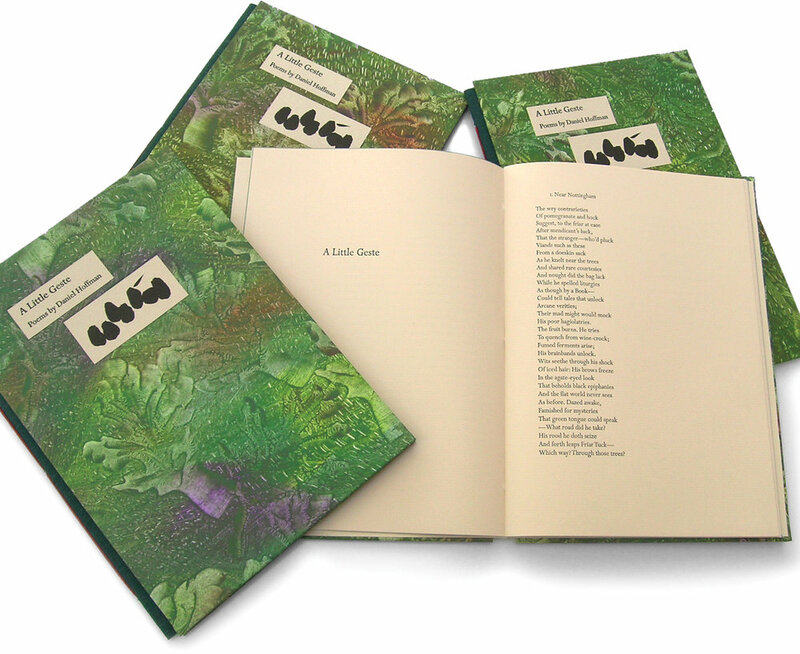 The book was produced in a hard cover (shown here) and a soft cover. Edition : 50 (hardCover), 90 (softcover). ⬆ This was a 'goody' bag for the American Printing History Association's national conference printed directly from wood and metal type. It was an interesting project because of the varying thicknesses in different areas of the bag and the makeready that required. Edition : 125. ⬆ This was a 4" x 6" type specimen card printed as a postcard on a nicely textured card stock. The color was added by hand to a nice floral dingbat. A nice piece to mail to friends to tell them about your new interest in lttr. Edition : 200.